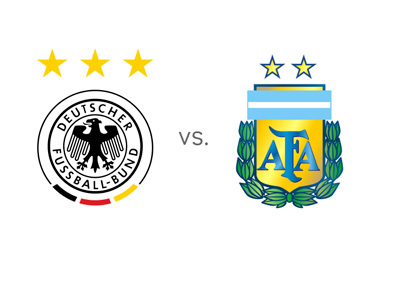 Germany and Argentina meet in the FIFA World Cup final on Sunday, July 13th, 2014 at the Estadio Maracana in Rio de Janeiro. Germany stormed into the final by demolishing the host nation with the score of 7-1. The German team is confident, convincing and full of winners on the club level. Manuel Neuer is arguably the best goalkeeper in the world at the moment, while their midfield, featuring Kroos, Khedira and Ozil. has been the most dominant in the tournament. Argentina have made their way into the final by beating Netherlands in the penalty shootout after a fairly boring 0-0 draw. Even though on paper the Argentinian squad has one of the most powerful attacking lines, Lionel Messi & Co. have been winning their games by a minimal margin in low scoring contests. After their performance in the semi-finals, it is no wonder that Germany are the big favorites to lift the trophy this year. Germany plays a fairly high line and they can be vulnerable to counterattack. One question that has been brought up recently is if the German team has peaked too soon? We will find out soon enough. Argentina are fortunate to have their striker, Sergio Aguero, back in the lineup, but they might not be able to count on their winger Angel di Maria, who is suffering from a muscle injury. Another thing that should be brought up is fatigue. Germany won their semi-final after only 30 minutes of play and were able to coast through the rest of the game. Argentina, on the other hand, grinded for the full 120 minutes and in addition have had one less rest day. Let's see how things play out on Sunday.